A new version 14.6 of USBCrypt software is available now for download and purchase! A problem has been corrected that caused Windows to display an error message when using the System Image backup program of Windows even though no Virtual Encrypted Disks have been started. Several other minor improvements have been made. Although the primary function of USBCrypt is to protect the external and removable drives from unauthorized access, it’s possible to encrypt the main system C: drive with it as well. 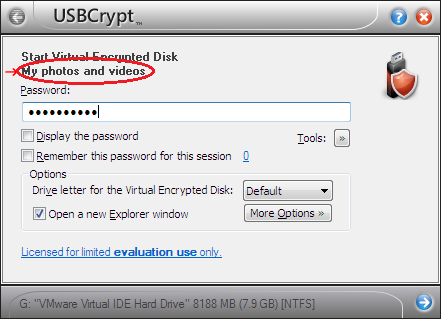 Yes, you can use USBCrypt software to create a Virtual Encrypted Disk hosted on the C: drive, and use it to store your sensitive files and folders in the Virtual Encrypted Disk. 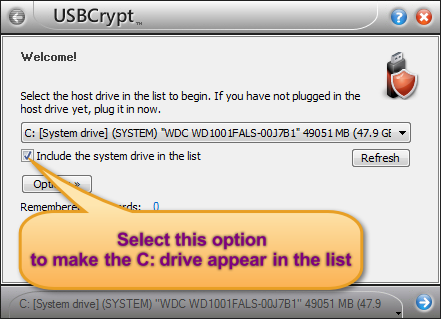 The only difference when using the C: drive as the host for the Virtual Encrypted Disk is that the C: drive is always plugged in to the computer. After that, you can proceed as usual: select the desired size for the Virtual Encrypted Disk, the encryption algorithm, the password and so on. Before starting, however, it’s a good idea to create a full backup of your system drive, to be able to start over if something goes not as expected. 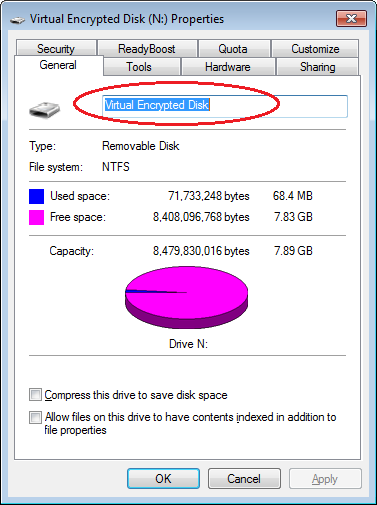 When deciding on the size of the Virtual Encrypted Disk to create, do not make it take all available free space: leave plenty of room on the host disk for use by Windows. After the Virtual Encrypted Disk has been created, you can start it as usual (it will have a separate drive letter, other than C:), and move the files and documents you want to be private to the encrypted drive. Be careful NOT TO MOVE the Windows folder and other folders you might see on the C: drive (such as Program Files, ProgramData, Documents and Settings, Users, etc.) These are system folders that must remain where they are, or Windows may start doing weird things. Only move the files and documents that need to be protected, leave everything else where it is. If you use an external drive to keep copies of your Microsoft® Office documents, you don’t want them to get into the wrong hands. Losing sensitive sales records or client data can spell disaster for your business! To be able to securely transport the files between different locations, or to take your documents on a trip with you, use our encryption software USBCrypt, specifically designed to create secure areas on the removable drives to protect your sensitive documents with passwords. Once an encrypted area is created on a removable drive, you can copy, move, or save any Office document directly to it, without the need to do any special encryption or preparation: USBCrypt takes care of all such details for you. You can open the documents right off the encrypted area, too, and save them back, as usual. In fact, you may not notice that you are working with the encrypted documents at all! The best time to worry about security of your documents, spreadsheets, or presentations is now, while you still have them. USBCrypt is very easy to use. It offers the wizard-style interface that guides you through the steps of selecting a password and encrypting your external drive. USBCrypt uses the strong encryption algorithms such as AES (Advanced Encryption Standard), using the key lengths 128 or 256 bits, to ensure absolute confidentiality of your files. The documents you save to the encrypted area can only be opened if you enter a valid password. Because USBCrypt stores your password in an encoded form using the Secure Hash Algorithm, no one would be able to discover your password, even if all computers on earth were forced to do nothing else but crack the encryption of your USB drive! The drives protected with USBCrypt can be used with other Windows computers, without USBCrypt software installed on them (with the administrator's permission, of course). USBCrypt also offers the option of creating a “spare key” file on your main computer, for use if you forget your encryption password. System administrators can find this option especially useful to make sure the encrypted files can be opened even if the employee is not available. USBCrypt fully supports all versions of Microsoft Office that are compatible with Microsoft Windows 10, Microsoft Windows 8, 7, or Microsoft Windows XP (both 32-bit and x64 editions are supported). It can protect not only external USB drives, but also other types of external drives, such as FireWire drives, Zip drives, and other types of rewritable drives. The pricing starts from $99.95 for a business license to install USBCrypt on up to 3 computers at the same location. Site licenses and quantity discounts are also available. Microsoft Windows 10 / 8 / 7 / XP. "Microsoft and the Office logo are trademarks or registered trademarks of Microsoft Corporation in the United States and/or other countries." In some usage scenarios, the Optimize for performance option could cause 100% of the available RAM to be consumed. We have corrected that. 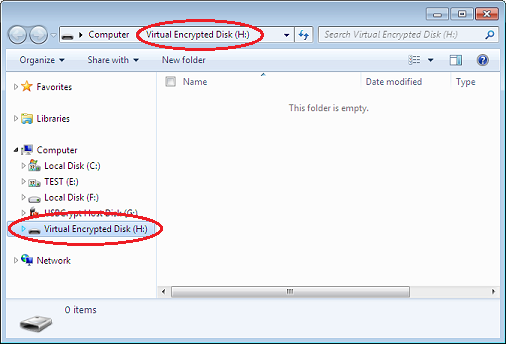 When encrypting a drive, the size of the Virtual Encrypted Disk can now be selected using units other than MB. The size of the Virtual Encrypted Disk is now displayed when choosing the Properties command from the taskbar icon right-click menu. If you are already using a previous version of USBCrypt, you don’t need to remove it: just download and run the new version, and it should update the previous version while keeping your settings and customizations intact. If you use USBCrypt to protect just one or two drives, it’s easy to keep track of them. However, when the number of the encrypted drives grows, it becomes more difficult to keep them organized. The fact that each physical drive can be represented by two drive letters (one for the host drive and another one for the Virtual Encrypted Disk it contains) does not make it any easier. 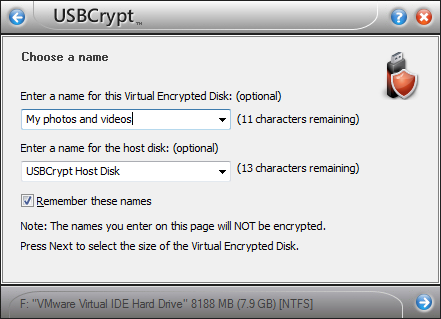 To help you manage the encrypted drives, USBCrypt offers you the options of assigning names to them. There are several names used by USBCrypt and Windows in different places of their user interfaces. Let us discuss them in detail. As you can see, by using different names with different Virtual Encrypted Disk, you can make it easier to recognize them in Windows. 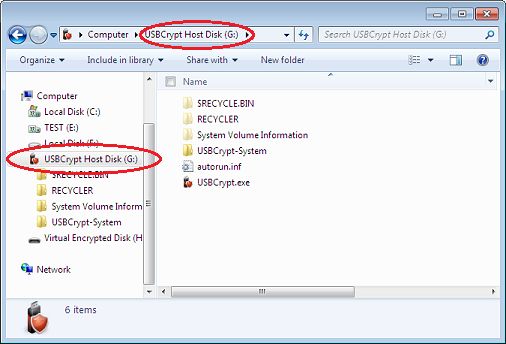 You can change the default name “USBCrypt Host Disk” to something more descriptive. Keep in mind, however, than both the Host Disk and Virtual Encrypted Disk names are NOT encrypted: they can be seen even before you enter the password to start the encrypted drive. 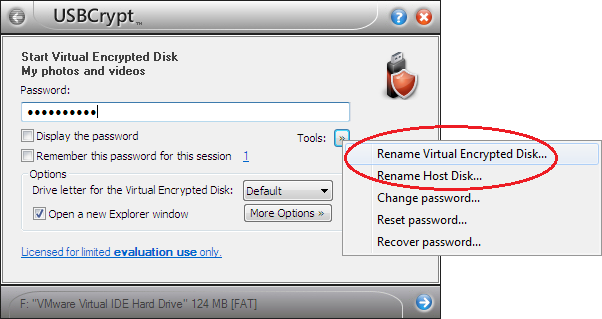 If you change the Virtual Encrypted Disk name, it takes effect immediately. However, if you change the Host Disk name, you may need to restart the computer before Windows would recognize the new name. Enter the desired name there, and the label will change. Unlike the Virtual Encrypted Disk and the Host Disk names we’ve discussed above, the Virtual Encrypted Disk label is encrypted, along with all other data the encrypted disk contains: this label is only displayed by Windows after you’ve entered the correct password to start the encrypted disk. We are excited to announce that a new version 10.8 of our encryption software USBCrypt has been just released and is available now! An option to select the preferred optimization of the Virtual Encrypted Disks: you can now choose whether to optimize for performance or for quick removal of the encrypted disks. An option to launch the "autorun" process "As Admininstrator" when starting or stopping the encrypted disks. You can now create custom names for the host disks (other than the default USBCrypt Host disk), to make it easier to recognize different disks in the Explorer windows. While the encryption process of a drive is in progress, you can now minimize the USBCrypt window to the taskbar. You may find it handly when encrypting large drives. Also, you can now pause and resume the encryption process, if you need to temporarily allow other programs to use the full CPU power fo your computer. The built-in backup software that comes with Windows 7 or Windows Vista can now recognize the Virtual Encrypted Disks as valid backup destinations for the documents and settings. USBCrypt now warns you if you log off or shut down the computer while a disk is being encrypted. And more! Please give the new USBCrypt a try. After the flash drive has been encrypted, you can start it (by entering its password) and it will become accessible via its own drive letter, just as any other drive. To encrypt a file, just move it to the encrypted drive (by, for example, dragging and dropping it using Windows Explorer or with our file manager AB Commander), and the file will be encrypted on-the -fly. To open the encrypted file, you don’t have to do anything special: you can double-click the file on the encrypted drive, as usual, and it will be decrypted transparently for you. When you save the changes, they will be encrypted automatically for you, too. In short, there is no difference between using the encrypted drive and a regular drive! After the encrypted drive has been stopped, all files and folders it contains become locked with your password again. At this point, you can detach the flash drive from the computer. You can sleep well at night, knowing that your files are safe and sound too.